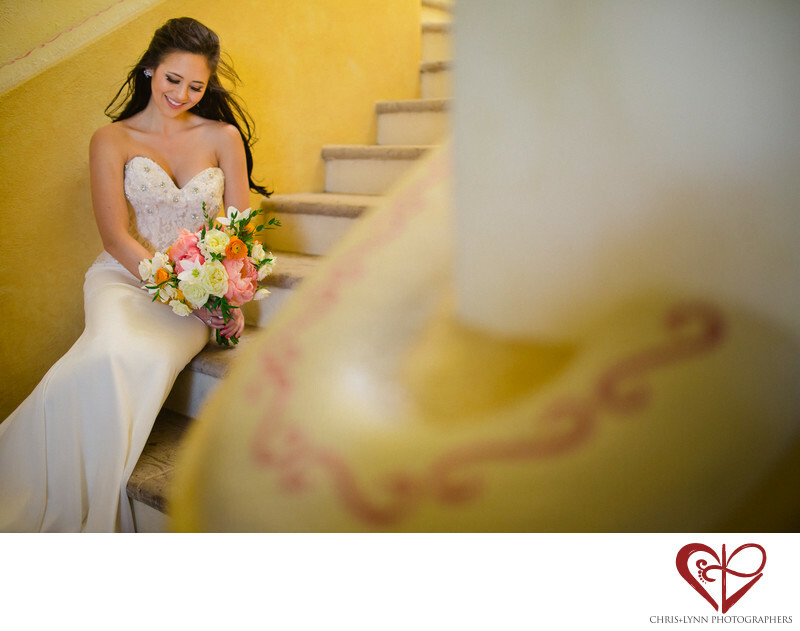 Cabo del Sol is a dream location for a destination wedding. This Cabo venue has all the elements of a Baja wedding: large Hacienda-style golf clubhouse with separate areas for bride with her bridesmaids and groom with his groomsmen to get ready; desert landscape with lots of big cacti; expansive views of the ocean, and a gorgeous tourist-free beach! What couples love about the grassy lawn ceremony area is guests can enjoy unparalleled views of the beach and ocean but don't need to take off their shoes or get their feet sandy. Especially for more formal weddings, it's nice for the ladies to be able to keep their heels on! The clubhouse itself is also big and airy with lots of soft flattering light. We loved the warm tones of this staircase and the Mexican patterns on the bannister. The colors matched the bride's bouquet perfectly and the mid-day sun coming through the window added a soft glow to an already effervescent bride! This image, though posed, feels more relaxed than a traditional 'bride looking into the camera' image due to the breeze gently blowing her hair, her casual smile, and unprompted glance down to her wedding bouquet. 1/400; f/1.4; ISO 400; 35.0 mm.